Thought about booking a Guilin vacation package? It's really easy with Expedia, and you'll be able to buy some fancy dinners or souvenirs for your friends back home with the money you save. Book now on Expedia and gain savings of up to 42%*! It's that easy! We've got more than 400 partner airlines and 321,000 worldwide properties to select from around the globe, which means your dream vacation is just at your fingertips! Feel free to cancel or make changes to almost any reservation and you won't pay a cancellation fee to us. Preparing to head off on your Guilin vacation? Can't decide what things to include in your travel itinerary? Don't stress — we're here to give you some handy hints. What's your perfect vacation? Whether it's mega malls or museums, heart-stopping activities or botanical gardens, Expedia is here to help you craft your ultimate itinerary. No matter how incredible your hotel room is, don't spend your trip stuck in your room or lying by the pool. There are endless new experiences to be had! For even more options, check out our Guilin things to do page. Expedia currently doesn't have any property listings for Guilin. However, you'll discover a few places to stay in Guilin City Centre, which is 17 miles (27 km) away. The Shangri-La Hotel, Guilin, Sheraton Guilin Hotel, Guilin Lijiang Waterfall Hotel, Guilinyi Royal Palace, Guilin Bravo Hotel, Grand Link Hotel, Guilin Golden Oriole Hotel, GuiLin Eva Inn Hotel, Guilin Bi An Bie Yuan Hotel, Four Points By Sheraton Guilin, Lingui, Guilin Sweetome Vacation Rentals, Guilin Central Hostel, Grand 0773 Hotel, GuiLin HongKong Hotel, Shanhu Hotel Guilin, Civil Aviation Hotel, Wada Hostel in Guilin, Guilin Tianyi Business Hotel, Guilin Golden Dragonball Hotel, Guilin Tian Tian Holiday Hotel, Hanting Hotel, Guilin Zizhou Panorama Resort, Guilin Royal Garden Hotel, Guilin Zheng Yang Inn, No. 16 West Lane Inn Guilin, Guilin Kawagarbo Hostel, Guilin Ming Cheng Hotel, Minfu Hotel, Universal Hotel - Guilin, Vienna Hotel Shanghai Road - Guilin, Wangfu Honglou Hotel, No.10 Inn, Wangcheng Boutique Hotel Guilin, Guilin Huguangshanshe Hotel, Guilin Lixin Hotel, Guilin Gangwan Yihao Hotel, Guilin Go Home Convenience Inn, Guilin Muslim Hotel, Guilin 26 Degree Hotel, Jingguanming Lou Holiday Hotel, Sai Kai Hotel, Dingshan Pastorale Hotel, The White House Hotel Guilin, Lifeng Hotel - Guilin, Qunyuan Hotel, Zhongxing Hotel, Guilin Oasis Inn, Hanting Express- Guilin Xiangshan Park, Guilin Xinxin Hotel, Oriental Pearl Hotel, Guilin Zhongshan Hotel, Guilin Aosen Business Hotel, Hanting Hotel, Yibai Express Hotel, Guilin Xiangshan Hotel, Guilin Travelling With Hostel, Sapphire Hotel - Guilin, Guilin Riverside Hostel, Guilin Zhongshui International Hotel, Osmanthus Hotel - Guilin, Guilin Ronghu Lake Hotel, Dazheng Hot Spring Hotel - Guilin, Perfect Season Hotel - Guilin, Guilin Guilai Hotel, Perfect Season Hotel Tiexi, Guilin Jinyi Holiday Hotel, GreenTree Inn Guangxi Guilin Railway Station Business Hotel, Guilin Homestay Hotel, Hantang Xinge Hotel - Guilin, Green Bamboo Hotel, Guilin Fengfan Art Theme Hotel, Guilin Haitao International Hotel, Wisteria Hotel, Jingxin International Hotel, Ping'an Business Hotel Guilin Branch, Ping'an Business Hotel, Guilin Anyi Hotel, The Star Hotel Of The World, Liang Guang Business Hotel- Guilin, Guilin 68 Degree Hotel North Train Station Branch, Dafu Kongjian Hotel, Home Inns, Jinsangzi Hotel - Guilin, Guilin Oriental Hotel, Lijing Hotel, Helen's Home and Vienna Hotel Guilin Airport Road are the best options for a good night's sleep in Guilin City Centre. Pass security, board the plane, check your boarding pass for your allocated seat and make yourself comfortable! Your exciting trip to Guilin is only a plane ride away. When you arrive at Liangjiang International Airport (KWL), you'll be approximately 30 miles (48 km) from all the main streets. Explore an intriguing waterfront rock formation with a fascinating legend and then hike up the hill for panoramic views of Guilin. 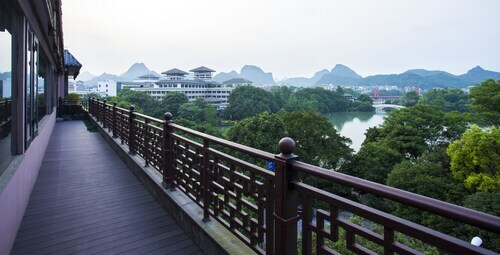 Guilin’s largest park is encircled by mountains and dotted with historic artifacts. Hike through the green expanse and sightsee its many treasures. Relax local-style in this leafy urban park, where residents come to play cards in the shade, practice tai chi and enjoy the stunning city views from the hilltop pagoda. This family-friendly hotel is located in the city center, within 2 mi (3 km) of Mulong Lake and Lijiang Folk Customs Garden. Shan Hu and Seven-Star Park are also within 3 mi (5 km). 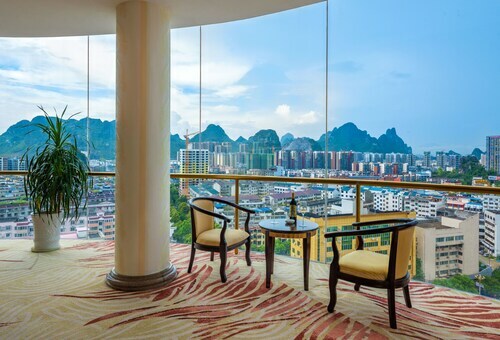 Located in Guilin City Centre, this luxury hotel is within a 15-minute walk of Shan Hu and Riyue Shuangta Cultural Park. Elephant Trunk Hill and Seven-Star Park are also within 1 mi (2 km). 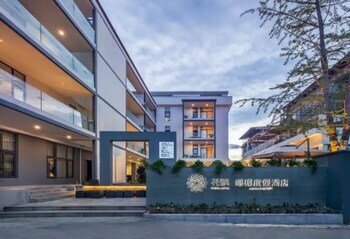 Located in Guilin City Centre, this hotel is within 1 mi (2 km) of Elephant Trunk Hill, Shan Hu, and Riyue Shuangta Cultural Park. Seven-Star Park and Reed Flute Cave are also within 3 mi (5 km). 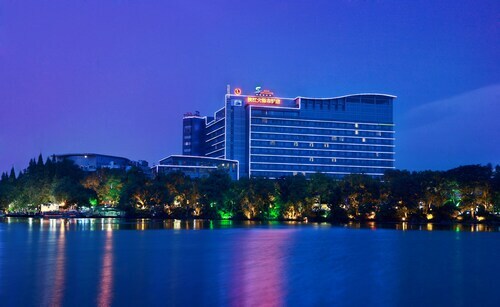 Located in Guilin City Centre, this hotel is within 2 mi (3 km) of Seven-Star Park, Riyue Shuangta Cultural Park, and Shan Hu. Lijiang Folk Customs Garden and Guilin Chuanshan Scenic Resort are also within 3 mi (5 km). 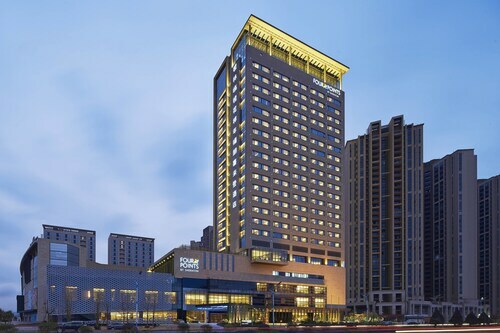 Located in the business district, this family-friendly hotel is within 12 mi (20 km) of Liu Sanjie Landscape Garden of Guilin, Guilin Chuanshan Scenic Resort, and Wanda Plaza. Guangxi Guilin National Forest Park and Elephant Trunk Hill are also within 12 mi (20 km). 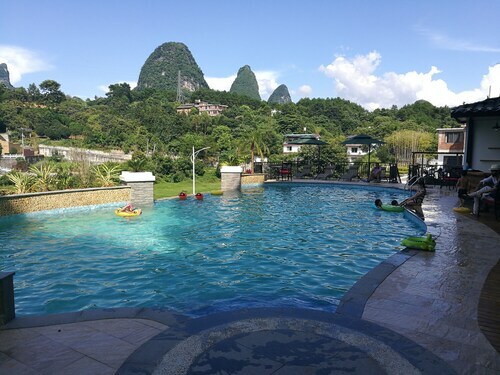 Situated in a rural location, this hotel is within 2 mi (3 km) of Yangshuo West Street, Yangshuo Park, and Impression Liu Sanjie. Moon Water Cave and Moon Hill are also within 9 mi (15 km). 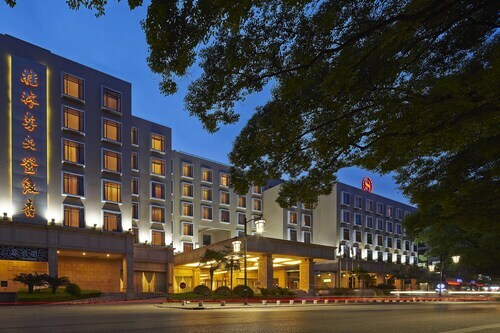 Located in Guilin City Centre, this hotel is within 1 mi (2 km) of Shan Hu, Riyue Shuangta Cultural Park, and Seven-Star Park. Elephant Trunk Hill and Mulong Lake are also within 2 mi (3 km). 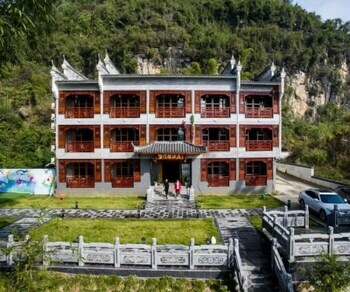 Located in Guilin City Centre, this hotel is within 9 mi (15 km) of Elephant Trunk Hill, Riyue Shuangta Cultural Park, and Shan Hu. Seven-Star Park and Reed Flute Cave are also within 9 mi (15 km). Taoyuan Intl. - Liangjiang Intl.